Nearly 5,000 Kitsap residents enrolled in private health plans during open enrollment for the Washington insurance exchange. Washington Healthplanfinder released final statistics from its inaugural open enrollment period Wednesday. The enrollment period ran from October through March. The 4,940 Kitsap residents who signed up for private health plans through the exchange accounted for about 3 percent of the 164,000 enrolled in private plans statewide. 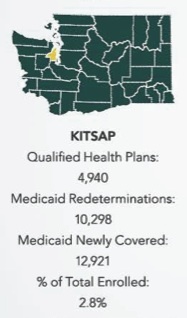 Another 23,219 Kitsap residents signed up for Medicaid through Healthplanfinder, either as newly eligible clients (12,921) or as clients who re-enrolled (10,298). Kitsap ranked tenth among Washington counties for total enrollment. An estimated 31,000 Kitsap residents were uninsured in 2012, according to a report from the state Insurance Commissioner. 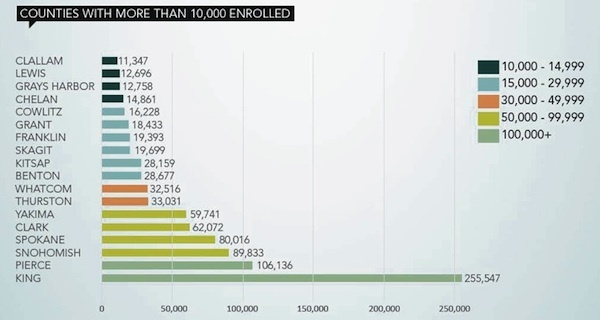 Of those, 17,300 were eligible for assistance under the Affordable Care Act.